One Romanian man has died and two others are missing at sea after a 2am collision with another boat, a senior detective has said. Four men left Shoreham Harbour in a small boat about midnight this morning to go fishing but were involved in a ‘tragic accident’ two hours later which has left one man dead and two unaccounted for. 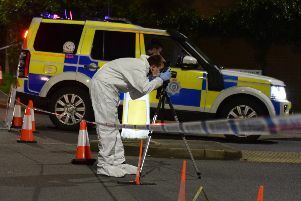 Detective Chief Inspector Rachel Carr said at Centenary House in Worthing this afternoon: “Police received a call from the Coastguard that a local fisherman had found a man in the water and had pulled him to safety. “We have completed an investigation and we believe that four friends went out fishing and whilst they were out on the water their vessel was struck by another boat. “We believe that this was an accident out at sea but enquiries are continuing. Police have confirmed the four men were all Romanian nationals living legally in the UK, two from Brighton and two from London. A search is underway for the two missing men. DCI Carr said what happened was a ‘tragic accident’ and foul play is not suspected, although Sussex Police is investigating in cooperation with the Marine Accident Investigation Branch. She added that no reports of another vessel have yet been received, other than the survivor’s account of what happened. The survivor has been identified only as a 45-year-old Romanian man from London. DCI Carr said: “He is stable at the hospital under observation at this time and is assisting with our enquiries in relation to this matter. She added: “I really want to thank the public for their swift response in relation to the media appeal earlier on this morning. “We have had numerous calls in relation to the incident. She added that people going out on the sea at night should follow normal procedure and ensure their boats are well-lit.